Born in Rijeka (Croatia) in 1981, and having acquired a strong international experience trough studies at the Hochschüle de Musik in Köln, The Royal Conservatory in the Hague, Moscow Conservatoire “P. I. Tchaikovsky”, and being laurate of piano competitions such as Franz Liszt-Premio Mario Zanfi, Concurso de Parnassos or José Iturbi International Music Competition, Goran Filipec, a musician of fiery energy and well defined artistic personality, reveals a particular leaning towards classical and romantic repertoire and music of pronounced virtuosity. At the present time he is a doctoral candidate at the University Paris-Sorbonne and the Conservatoire National Supérieur de Musique et de Danse de Paris, with the subject of the dissertation related to piano transcriptions. Naum Grubert, Oxana Yablonskaya, Natalia Trull and Evgeny Zarafiants are the pianists and teachers who mostly contributed to his musical identity. Within his present doctoral research, his mentors are Jean-Pierre Bartoli et Denis Pascal. He performed in Europe, United States, South America and Japan. His Carnegie Hall debut took place in 2006, followed by performances in venues such as Mariinsky Theatre, Auditorium di Milano, Minato Mirai Hall or Philharmonie de Paris, among others. Presently, Goran Filipec is recording for Naxos label. 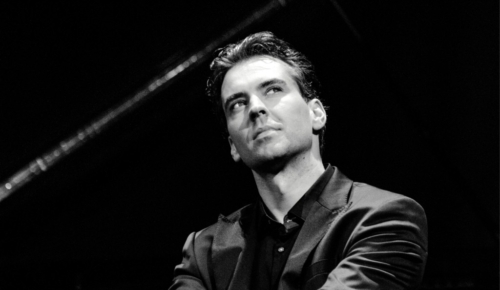 Goran Filipec was invited several times to the festival Contemporary Piano Faces at the Mariinsky Theatre in Saint Petersburg, and he could be heard at the festival Progetto Martha Argerich, where he performed on invitation of the famous Argentinian pianist. His first disc, recorded in 2008 in the United States with Eroica Classical Records, was devoted to Mussorgsky and Rachmaninoff. Released for the 200th anniversary of the birth of Franz Liszt, his second disc “Anniversary Resonances”, is composed of major pieces from the Hungarian composer. His third CD, released in 2014 by Naxos, presents the works of Yugoslavian composer Ivo Maček. In 2016 his CD Paganini Studies, dedicated to the complete versions of the studies Liszt -Paganini, and released by Naxos Records, was awarded by the Grand Prix du Disque of the Ferenc Liszt Society of Budapest. With this prize, Goran Filipec follows the prestigious list of laureates such as Vladimir Horowitz, György Cziffra, Alfred Brendel, Claudio Arrau, Zoltán Kocsis ou Maurizio Pollini.